Read here about a pavilion built with tensegrity structures. This article is based on the creators' paper "The Underwood Pavilion," see references below. The Underwood pavilion was the result of a Digital Design Build Studio taught by Gernot Riether, Andrew J. Wit and Steven T. Putt at Ball State University during the summer of 2014. The course was an intense, five-week Digital Design Build Studio consisting of eight graduate students. Its goal was to develop a portable pavilion for the University’s hometown of Muncie, Indiana, based on tensegrity structural principles. Tensegrity structures have large advantages over other structural systems. They are through their use of predominantly tension members lighter and stronger then conventional systems. The systems materials can be optimized in a more efficient ways since their components work either in pure tension or compression. The use of a parametric tensegrity structure had in the case of the Underwood Pavilion proven effective as a temporary structure because of its self-erecting behavior and its range of adapting geometry. Simplistic and precise details within the pavilion proved that using complex tensegrity structures for a small-scale enclosed structure can still allow for a fast and accurate assembly process while maintaining the possibility of collapsing a mobile pavilion into bundles of cables and rods for easy transportation. The findings from structural simulation and from the construction of the pavilion itself will allow for further prototypes to explore the possibility of more irregular tensegrity systems which respond to new sets of parameters in the future. The structure is composed of fifty-six three-strut tensegrity modules. By parametrically adjusting their dimensions, the designers were able to control both the curvature of the pavilion and the size and shape of several openings that frame views of the site. Each module is dressed in white Elastan, a performance fabric that makes shade during hot Indiana summers and introduces curves in an otherwise linear structure. This material consists entirely of renewable materials and reusable plastic. While the elastic shell covers all the pressure rods, the tensed components are visible from the outside, giving the pavilion its unique appearance. This textile treatment emphasises the individual modules rather than the single, continuous structure, giving the impression of a delicate balancing act where in fact there is impressive rigidity. 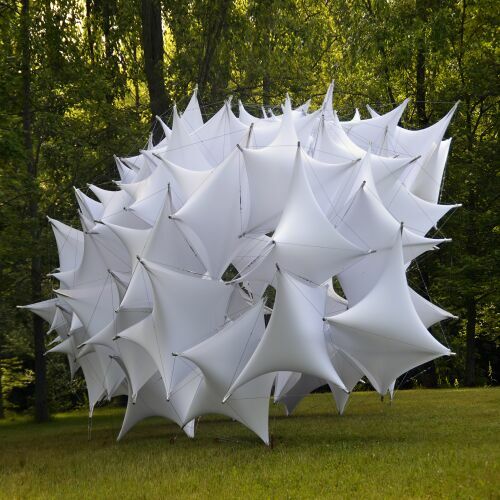 The resulting parametric tensegrity structure, with its 56 lightweight, self-shading modules of Elastan fabric, provided Art Fair visitors with refuge from the sun and framed views of the surrounding landscape. The Underwood Pavilion enriched the park: its striking look among the meadows and woods was an attraction for design experts as well as other visitors. Selected videos regarding the Underwood pavilion. For more photos, visit the Underwood Pavilion Photo Gallery page. During the Digital Design Build Studio's first week, students self-organized into a series of four collaborative research based think tanks. Based on group interest, each research group created a general overview to identify unique aspects of computational design in relation to envelope, structure and material. Following the first week’s completion, the think tanks presented their outcomes as proposals and decided to further investigate the creation of a tensegrity structure clad in tensile fabric. Rather then utilizing the traditional model based means of form finding, students decided to rethink the process through the creation of novel structural simulation tools within Rhino 3d and Grasshopper. During the second week four new teams were formed: Team A investigated methods for the computational programming of tensegrity systems. Team B investigated materials, performed cost analysis as well as tested full-scale structural mock-ups for feasibility. Team C specialized in fabrics (typologies, material properties and modelling). Team D investigated techniques for the creation of both digital and physical representations of tensegrity structures. Throughout the third week, a series of design charrettes, in-class workshops and critiques with outside experts and structural engineer consultations helped finalize the project’s formal and material pallet. During week four, students acquired materials and prepared for fabrication. Small and large-scale prototypes were fabricated from standard materials allowing for rapid prototyping. Environmentally friendliness, long-term durability and efficiency were major criteria during the final selection of materials. After many intense studies, aluminum pipes were chosen for the compression struts, galvanized steel cables for the tension members and Elastane, an elastic membrane for the envelope. The fifth week was used for in-house fabrication, structural testing and initial assembly. Three individual teams first prepared all of the module’s components: Team One fabricated all Aluminium Compression Members. Team Two oversaw the preparation of all tension members and Team Three fabricated all tensile fabric components. Students setup fabrication and assembly spaces throughout the Department that allowed for them to collectively and rapidly assemble and structurally test all the modules and elements in teams of three. On site assembly was accomplished in only two days. Bundling of the module’s cables and struts before transporting allowed for quick and easy reassembly of the modules on the site. Finally, the modules were assembled, joined and skinned. This was all accomplished within a $5K budget. The Underwood Pavilion was built from forty individual tensegrity modules linked together creating the final overall form. The advantage of utilizing a tensegrity structure for the pavilion was that the system could be lighter, stronger and more cost efficient than conventional structures such as space frames or truss systems. Another advantage was that materials could be optimized more effectively since the struts work in pure compression while the cables work in pure tension. Nonetheless tensegrity structures cannot be predicted from their geometric characteristics alone. The design process must take into account that a tensegrity moment can only be achieved through a structural equilibrium. The students used Rhino 3d’s plug-in Rhino Membrane, the Grasshopper plug-in’s Kangaroo and Galapagos to enable form finding and the structural solving of tensegrity systems through a methodology of finite element analysis. This provides real-time feedback of structural behaviour in both individual and aggregated modules, a necessity within the geometric form-finding processes of the pavilion. A 3 strut tensegrity module was chosen as a base constraint that helped minimize the solution space in designing the individual modules and the pavilion. To find the optimal formal geometry as a resultant of combining these sets of variables, two physical experiments and one digital simulation were conducted. Rubber bands were used for the first physical models to approximate length of cables for struts of different lengths. Based on the outcome of the first set of models, a second set of physical models were developed in which the rubber bands were replaced with strings. Within these studies, minor adjustments were necessary to find the final resting length of strings and their corresponding struts allowing for the models to reach a stabile tensegrity state. These physical models created a simplistic starting point for the digital simulation. Rhino Membrane, Grasshopper, Galapagos and Kangaroo were utilized for the project’s simulation. Rhino membrane, a plug-in designed for Rhino 4.0 was used for initial module form finding, digital feedback and enclosure optimization. Galapagos was used on singular modules to find an optimal geometric fitness for the two unknown values of rotation and distance between faces (Figure 2). Galapagos was also used for real-time feedback when manipulating individual module proportions, while continuing to maintain a high level of mathematical accuracy (solutions within a thousandth of an inch). Through Galapagos, variation of individual modules could be created (through a series of number sliders or value inputs), compared and directly implemented into the Kangaroo solver for interpreting the overall form. Through this workflow, designers were able to continually modify the pavilion’s overall form through the manipulation of a single module’s variable. Kangaroo, a Live Physics engine for interactive simulation, optimization and form finding developed as plug-in for Grasshopper was used to simulate each possible outcome achieved through the aggregation of modules. By defining a series of attractor points in the location where compressive rods and tensile cable intersect, the software enabled linking the individual modules into a single continuous system. With the connection of the cables and struts, the overall form slowly recalculated and found its form in equilibrium. When reconfigured and combined, these applications enabled the designers to define the final form through the definition of all necessary points of connection, as well as forces on all struts and cables. The resultant of the simulation was then revised through the manipulation or removal of individual modules to allow for asymmetrical deformation to the initial form, while minimising excessive tensile forces that would be encountered during construction. The complexity inherent to computationally calculating tensegrity structures, led students to create a continuous feedback loop; first testing ideas in physical models, than confirming their outcomes digitally. On the other hand digitally confirmed results were immediately tested as physical prototypes. This feedback loop between physical and digital modelling allowed for complex problems to be detected and solved quickly. Precise and highly descriptive models became a necessity, as time throughout the semester was extremely limited. Designers learned to track the complex behaviours of individual elements and modules within the structure by creating very simple numbering, colour, and vector based systems. Tying a simple coloured string to repeating elements in a physical model or a coloured vector in the parametric model for example, allowed students to easily find corresponding connection points. Understanding methods of physically and digitally tracking behaviours of individual components within a larger system played an important role during full-scale construction, where connections become extremely complex. Working both with individual modules and complex aggregations, students learned to quickly understand the effects small changes on a component could have on the pavilion as a whole. Varying size or tension in a single module could affect the shape, structure and rotation of the entire form. Full-scale prototyping was an important feedback mechanism within the studio. If an individual or group had a proposed design idea, it was immediately necessary to test its workability, availability as well as cost effectiveness. If any of these could not be found or achieved, the designers immediately revised their idea or merged with the design process of another group. With only one week for fabrication and construction, it was imperative that a robust production system was designed and implemented. While prototyping, students developed a step-by-step fabrication process utilizing individual strengths, machines and space to maximize efficiency. The final tensegrity state of a module can only be reached with all members in tension or compression. The entire system remained loose until the final turnbuckle is attached. The modules can be stacked and transported efficiently as a loose low–volume bundle of bars and cables (3” x 3” x 6’). At the site of construction, only a single cable per module had to be joined to create the final module’s form. Each module described a volume that varied between 3’ x 3’ x 3’ and 4’ x 4’ x 4’. This enabled the designers to move all modules to the site in their most compressed form while maintaining a level of formal adjusting through the manipulation of member tensions on site. Cables were pre-cut to length for each of the 9 nodes per module. Precise grooves and holes within the aluminum tubes facilitated the locking of the cables in place through the use of simple cable stoppers and pins. By inserting a turnbuckle at the center of the final connecting cable, stress was easily regulated within the modules until each unit had snapped into its predicted final geometry; individual modules tension could be adjusted to reach the final form. Once all of the modules were connected the entire structure was anchored. Standard 30” earth anchors were used to secure the pavilion from wind and snow loads. Elastane, a stretchable fabric originally used for sportswear was adapted to create the pavilion’s skin. Created by filaments that are more durable then non-synthetic materials such as rubber, Elastane can also be derived from 84% recycled polyester. Finding the precise pattern for cutting the fabric required taking a stretch factor of 40% into account. This was derived from experiments utilizing a 1/1 scale module prototype. Having studied the elastic behavior of the material, students digitally modeled the fabric in Rhino Membrane. The 3d model was then unrolled with the holes necessary to connect the fabric to the struts. The final fabric pattern was calculated to a width of 62”, the same width of the fabric roll offered by the supplier. This minimized material waste. The modules were “dressed” after the entire structure of the pavilion was assembled. This affected how the fabric was unrolled and the pattern was developed. After the dressing of the pavilion, each module divided an enclosed volume that as a pattern created a self-shading system. The self-shading structural envelope created a cool environment in the hot summer months of Indiana, and as a windbreak in the cooler fall months. The major source for this article is the creators' paper, "The Underwood Pavilion, An investigation in parametric tensegrity structures, in Ikeda, C. M. Herr, D. Holzer, S. Kaijima, M. J. Kim. M, A, Schnabel (eds. ), Emerging Experience in Past, Present and Future of Digital Architecture, Proceedings of the 20th International Conference of the Association for Computer-Aided Architectural Design Research in Asia CAADRIA 2015, 663–672. © 2015, The Association for Computer-Aided Architectural Design Research in Asia (CAADRIA), Hong Kong. This page was last edited on 3 December 2018, at 17:24.